We offer Affordable Care Act services to employers of all sizes to meet the IRS requirements of the Affordable Care Act. At Affordable Care Act Compliance & Services, Inc. (ACACS, Inc.), we realize each organization has a unique set of needs. We can provide your company with a tailored solution complete with personal service & consulting, compliance management reports, and full year end reporting solutions to employees and the IRS. We have a long history of working in government regulation and bring to the table over 40 years of experience with Affordable Care Act services including compliance, record keeping & administration, government reporting and audit documentation. Navigating and analyzing Affordable Care Act regulations is difficult and confusing. Our concierge Affordable Care Act services offer you a dedicated account manager who will answer your questions and guide you through the maze of regulation with personal service. ACA Compliance starts with powerful technology! Our compliance solution helps employers do a more precise job of managing ACA related health insurance costs. Our solution identifies, forecasts, and tracks employees in determined measurement periods to help mitigate penalty exposure. Our forecasting tools help you measure resources and stay on top of employee hour fluctuations. Our Affordable Care Act solution provides finance and human resource teams with comprehensive, easy-to-understand ACA monthly compliance reports. Our detailed reporting package helps you maximize your options and avoid government penalties. Our solution offers a full audit trail so organizations can view ACA compliance status and employee benefits eligibility by employee at any point in the past – crucial when responding to IRS inquiries. We process the data that will populate the required IRS 1094-C and 1095-C forms for all benefit eligible employees that are active throughout the tax year. Forms are delivered to the employer in a selected format and there are options available for your transmission to the IRS. Trying to complete the forms on your own? To calculate the estimated cost for completing these forms, use our ROI Calculator. Because these regulations are still changing, it is vital to keep open lines of communication. We will keep you up to date and provide you with professional and current advice on how to navigate the Affordable Care Act. Our ACA solution provides finance and human resource teams with a comprehensive, easy-to-understand ACA monitoring system. We provide benefit eligibility reporting and tracking of monthly activities, such as offering or terminating benefits and forecasting resources, needs, and trends. Our affordability reporting shows current calculated affordability for benefit-eligible employees. All allowable “safe harbor” calculations are built-in, including analysis tools that determine your maximum monthly allowable premium along with the lowest hourly rate threshold to remain affordable. We help you stay on track by outlining adds, drops, variable-hour employee eligibility, and COBRA responsibilities. Our ACA system allows for visibility across the organization, including a drill-down into designated departments and subsidiaries. For more information on Affordable Care Act services, please fill out the form below and we will be in touch with you shortly. 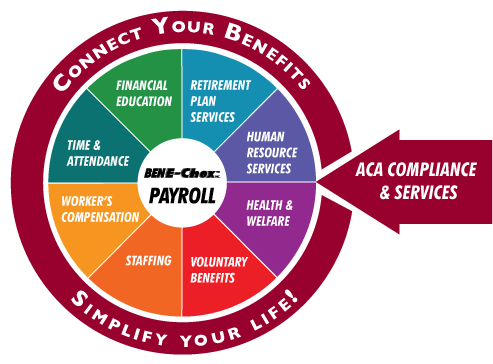 Connect your benefits with our payroll and simplify your life! Click here to learn more.